At 6:00 pm, on 10/2, at the Goethe Institut (No. 56-58 Nguyen Thai Hoc, Hanoi). The opening ceremony of “Shape of Round” of Pham Khac Quang takes place. 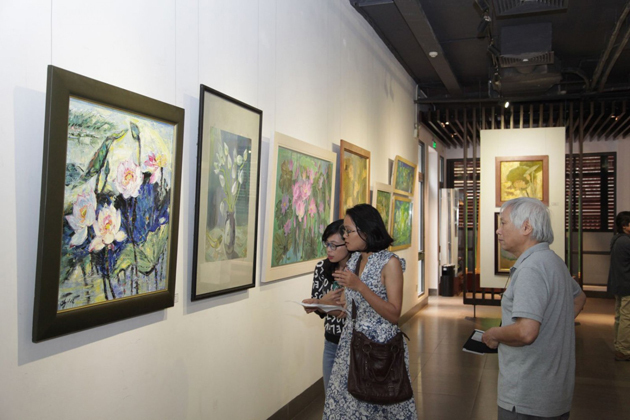 The exhibition “Shape of Round” is a collection of the best works of Pham Khac Quang including the portrait of the members of his family and all the familiar landscapes. For him, these works come from the fun, the grief he experienced. Many years working with woodcuts rekindled in Pham Khac Quang a special affection for printing practice. This technique is performed with multicolor of printing but only by one mold. A talk and practice with artist Pham Khac Quang will take place at 15 o’clock on 25/2/2017. Artist will present and demonstrate printmaking techniques in the use of his materials and his tools. Participants will also have the opportunity to create their own prints. Pham Khac Quang was born in 1975 in Hai Duong and graduated from the University of Fine Arts in Hanoi Vietnam. His works are exhibited not only domestically but also appeared in international exhibitions in China, Denmark, and Belgium. He lives and works in Hanoi. The exhibition is open free until 15/03/2017. From 10 – 17/02/2017, at Gallery39 (No. 39 Ly Quoc Su, Hanoi), painter Le Thiet Cuong will hold exhibition and book launch titled “Pottery Poetry” on the occasion of Vietnam Poetry Day (11/02/2017). From 21/1 – 28/2, at Thu Bay Coffee (3A Ngo Quyen, Hanoi), the exhibition “Hanoi” of Hanoi Urban Sketchers group will occur. They kept those memories over time when Hanoi is changing along with the process of urbanization and gradually clear away the precious inherent value. In addition to heritage conservation elements of Hanoi, Hanoi Urban Sketchers desire to help the community, who lived and is staying in Hanoi and lovers of the sketch, understand and love Ha Noi. With the aim of being a playground for lovers of Hanoi, Hanoi Urban Sketchers group recorded images of heritage, beautiful pictures, and typical lifestyle of Hanoi through the sketch with their own emotions. Hanoi Urban Sketcher operates with the purpose of sketching and sharing the images and meaningful moments of Hanoi over time and then showing to the community so that they can have a better knowledge about where they live as well as promote the splendid pictures of Hanoi to the world.